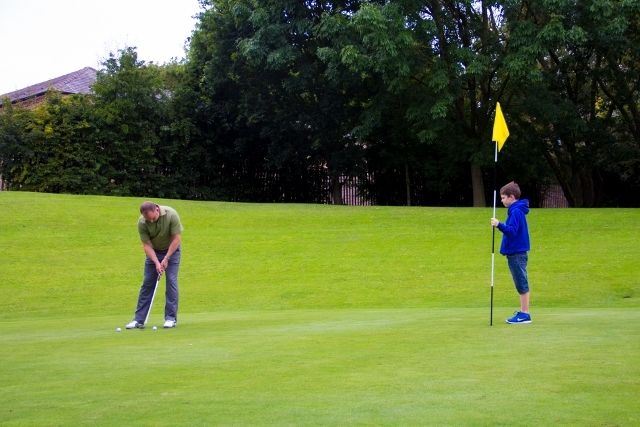 Photo: Father and son make it to the green at Sherdley Park for some early morning golf. Golfers with busy schedules can now find a great way to slot in some quality time on the fairway at one the North West’s premier pay-and-play golf courses. Sherdley Park Golf Course is offering the opportunity to play a six-hole round for £6, on a set of the course’s best holes – handpicked by seasoned players. Fine tune your long and short game within your busy weekly schedule. Available between 7:00am and 9:00am, Monday to Friday – you can complete the round in less than 60 minutes at a steady pace. With its tree-lined fairways and undulating terrain, the course provides a healthy challenge for golfers of all abilities. For the dedicated golfer, Sherdley Park Golf Course offers membership packages starting from just £25 per month, which grant unlimited play on the course and access to the park’s Golf Driving Range – a great place to hone your swing. Get your golf season and your day off to a great start with a six-hole round, under-par at just £6 – never say ‘no time’ again with this great offer. For further details or to book please telephone 01744 813149 or visit www.sthelens.gov.uk/goactive.